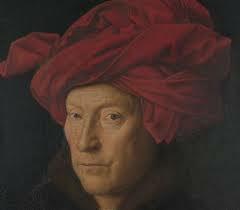 The Man in a Red Turban: thought to be a self portrait. 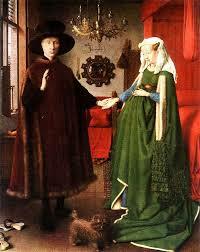 Van Eyck is accredited with developing techniques with the recent innovation of oil paints. For most of his career he was sponsored and is believed to have been secretly sent to Spain to broker the marriage of Philip of Spain to Isabella of Portugal whose portrait he painted. This all took place against the background of exploration when Columbus set out on his voyage of discovery. 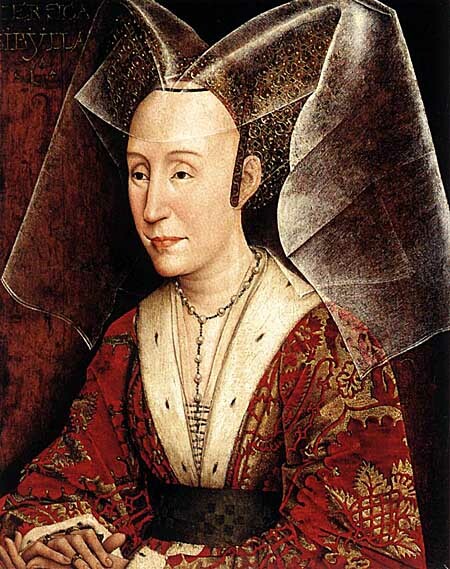 It was the fashion for women to scoop up their rather voluminous robes as depicted in this portrait, so the bride is not necessarily pregnant! 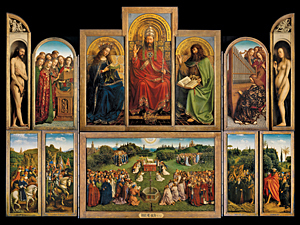 This painting, probably done by both Jan and his brother Hubert, is regarded as being one of the earliest major paintings in oils. Napoleon is reputed to have stolen it, then the Calvinists threatened to burn it and the Nazis coveted it. In 1935 one of the panels was stolen and has yet to be recovered.